I love July so much. Summer is going full force and there is still a lot of it left. Friends have you over for impromptu al fresco dinners (above), pool days turn into pool nights, kids stay up late and wake up late. 1) We celebrated the July 4th holiday with our annual barbecue at Uncle Jim’s house (I actually got in, or semi got into the pool, which happens maybe once a year, if that. Is it 90 degrees? Then no, I’m not in the pool) and by watching the Grosse Pointe Farms fireworks show with friends atop the Grosse Pointe Academy lawn. 2) I finally made it to the John K King used bookstore in downtown Detroit, a place I’d been wanting to go to since we first moved here. Plan to spend at least an hour browsing the shelves filled with over a million books, less time if you have kids in tow, which we did. They have a huge collection of rare books, but they sadly did not have a copy of The Wonderful Flight to the Mushroom Planet, a sci-fi title that my husband and I both read as kids and have been curious to see if it’s really as good as we remember. Yes, the book is available online, but with a new, dumb cover illustration so I refuse to buy it. 3) I did pick up three books, one of which I’d been wanting – Kate Atkinson’s “When Will There Be Good News?” since I read her first two detective stories a couple years ago. She’s also the author of “Life After Life” which is a giant of a book, but goes quickly and is a must-read. I just finished “When Will There Be Good News?” last night and really enjoyed reading it. I’ve thought about it a lot since I put it down, which is always a sign of a good book. Or good anything. 4) We stopped at Lafayette Coney Island before the bookstore trip, as it was on our way and the Mister (who doesn’t like this photo because “no one puts ketchup on a coney dog” insert eye roll emoji) was hungry. He got coney dogs (obviously) and fries, and I shared an order of fries with the girls. The restaurant is right next door to American Coney Island, and Detroiters are very passionate about which restaurant they think is superior. 5) My sister’s family of four came to visit us this month. We mostly wanted to just hang out since we usually only see each other once a year, but of course we had to do some touristy things, as they’d only been here one other time in the dead of winter. We randomly stopped at Shake Shack for lunch and I was pleasantly surprised at how good it was. Service was fast and friendly and food was yummy and fresh. Really great for a fast food joint and I’d definitely go there again. 6) The beach area at Campus Martius was fantastic. There was music playing (DJ), foosball, a huge Jenga set, and lots of people-watching. 7) We also went to the Riverwalk, which the kids love. As we were heading back to the parking lot, we watch a group of girls take photos for a quinceanera celebration. 8) On what was possibly the hottest day of the year, we went to Belle Isle and stopped at the aquarium and conservatory (extra hot and humid, we were all dying). We had plans to go to the beach, but when we drove by there were so many people and we didn’t want to deal with the crowds or the parking. So we decided to try the slide, which turned out to be highly entertaining, especially for me, as I was not participating, and got to watch as my brother-in-law got going a little too fast and caught air on the bumps. Hehe. 9) Why did it hail in the middle of July!? All of a sudden the clear sky turned gray and a deluge of rain came down, followed by a minute of hail. No locusts, though. 10) Have you been to Otus Supply in Ferndale? My book group gals and I Ubered there in lieu of our usually meeting and tried just about everything on the menu. All of the food was quite good, right down to the sourdoughnuts, but my margarita was too sweet. From what our server told us, they also have a great live music scene on certain days of the month. 11) We were invited by friends to a rental cottage in Lexington, Michigan, for a weekend. The drive is about one and a half hours – quick compared to the majority of getaway spots, which are 3 to 5 hours away. It was a cute little town with a handful of restaurants and shops and lots of summer cottages. On our first night, we walked through town to the park, where a bluegrass band was playing. We dipped our feet into Lake Huron and skipped stones. The rest of the weekend was cold, humid and rainy – not ideal – but we made the most of all the breaks in the rain by going for walks (me), or to the beach (them) which you got to by going down a steep flight of stairs, or sitting by the fire (all of us). I walked by so many wild sweetpeas, which I’d only ever seen growing on a farm, so that was exciting for me. 12) A little baby bluejay hung out in our lilac tree for three days. He was the cutest, fluffiest thing and I worried that the blackbirds were going to scare him, or that he’d fall and some creature or cat would find him, but since I didn’t see him after the third day, I’m going to assume he flew away and is somewhere in the trees, happily enjoying summer. We’re off for what is becoming an annual trip to upstate New York, one of my most favorite places on earth. San Francisco, yes. Florence, absolutely. There are many other beautiful and exotic places, but there is something about dairy country that I can’t shake. Follow along on Instagram, or get filled in on next month’s list. Happy August! Okay, y’all. I’m doing it. The Weekly Photo Challenge. For those of my non-blogging Followers (and I have a bunch – love you guys! ), the challenge is announced by WordPress (the host of my blog) each Friday. The purpose of the challenge is to spark creativity, but it also gives us the opportunity to see others’ interpretations of the theme. SO… because I can’t help myself and because I have nothing better to do (like maybe pack up a house in less than a month and no, I haven’t started)…basically, because I am out of my mind crazy, I’ve decided to play. I’d never call myself a photographer and don’t have any other camera except my iPhone (wish), but what I love about this game is that there’s no right answer and anyone can play. 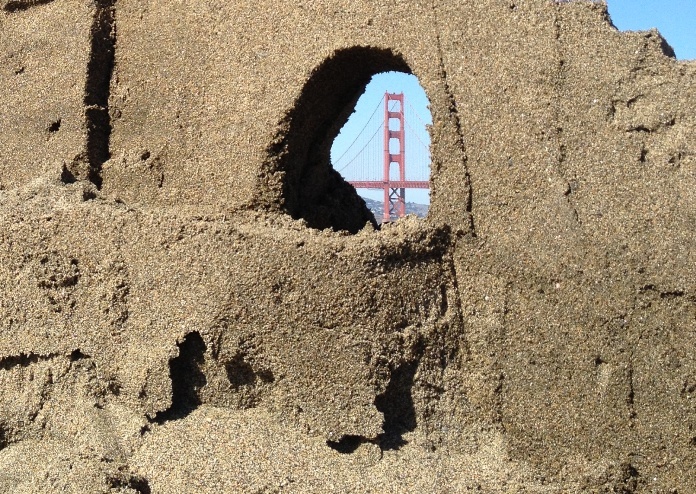 Above is a shot of the Golden Gate Bridge. And below, the original photo. 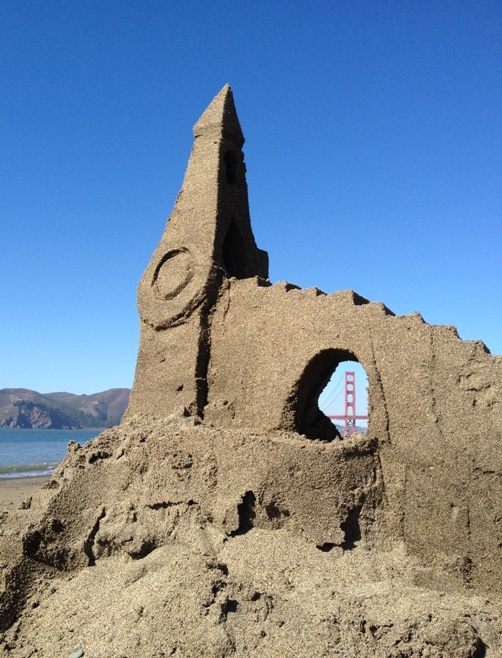 I took it several months ago while hanging out with the girls at San Francisco’s Baker Beach.